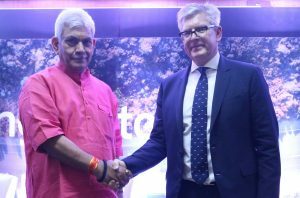 Ericsson announced that it has established a Center of Excellence (CoE) and Innovation Lab for 5G in the country at the Indian Institute of Technology (IIT) Delhi. This 5G innovation Lab, which has been set up by Ericsson for Indian industry and academia to leverage, was dedicated to the nation by the Hon’ble Minister of State for Communications (I/C) and Minister of State for Railways, Shri Manoj Sinha together with Börje Ekholm, President and CEO, Ericsson at the IIT Delhi. As per an Ericsson report, 5G enabled digitization revenue potential in India will be US $27.3 billion by 2026. The Indian operators can generate additional revenue of US$ 13 billion or half of the stated potential if they take up roles beyond being Connectivity and infrastructure providers to become service enablers and service creators. The largest opportunity will be seen in sectors like manufacturing, energy, and utilities followed by public safety and health sectors. Some of the 5G use cases that could be implemented using the unique features of 5G technology include industrial control and automation, autonomous driving, safety and traffic efficiency services, hospital applications, and medical data management amongst others. Ericsson conducted India’s first 5G over the air beam tracking demonstration on 3.5GHz spectrum using a pre-commercial end-to-end system including 5G-NR, VRAN, and VCORE. The demonstration includes 3GPP 5G NR Multiple-Input Multiple-Output (MIMO) antenna technology with adaptive beamforming and beam tracking techniques to deliver robust and sustained mobile broadband communications. By beam steering, a highly-focused beam, a stronger radio signal with higher data throughput is delivered over a greater distance using less energy. The results are spectral efficiency enhancement and gains for capacity, cell edge throughput and mean user throughput.